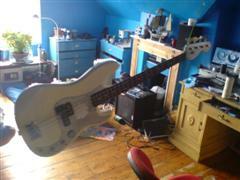 So, actually, i decided that i didnt like the headstock silver and i removed the silver. Now it only has a silver scratchplate in the style of the MM Stingray 5 (ish). I am also planning to put in a MM humbucker on the bridge, and a diagonal J pickup just above the P one. Each one will have a volume knob only, and an overall tone knob, but the MM will have a 3 way switch to select a row or all the poles. More on this later. Well, its later, and now ive ordered all the parts for it. Instead of the MM and J, i decided to put a single coil from seymour duncan in at the neck, for a better sound. 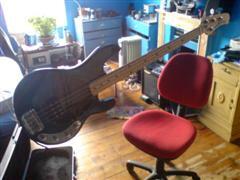 As for the MM, P, J pickup arrangement, i decided to buy a new bass to do that on. But for this one, i just need to do some routing for the pickup and a bigger electric cavity. So once complete, ill put another pic up. 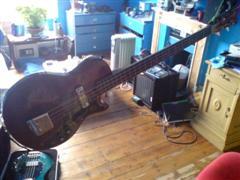 So, here is the second bass i recieved, back in 2005 summer. It was for my birthday from my mum and dad. It has 24 frets, so i could play more songs on it, like "by the way" by the chilis. It is very light in weight, and quite fun to play. I lent it to my sis's ex and he kinda broke the pots and one of the tuners. So i paid for a new tuner, and only recently replaced the pots, although it crackles a bit still. I'm also planning a major overhaul on it, but thats for later. Well, it's now later, and the overhaul is finished. i have managed to fix the crackle, it was because the pots hadn't been properly soldered. The overhaul was to completely re-finish it in... DENIM. It took about 3 days, but now it looks awesome. I have also resparayed the back of the neck in matt black paint, the same i used for my motorbike. It is now complete!!! Well, this is the first bass i actually bought, and it was when pix and myself went with his dad to the angelsey bike rally in 2006. In the next field to where we were camping was a massive carboot sale, so we popped over. I found this among other guitars and basses, being sold by a guy who displayed them in his restaurant, and got it for �40. Now, the date i believe this to be made, according to when similar ones were manufactured, and its state, is around the late 60's. When i got it, i gave it a clean, and now the only thing wrong with it is the e string is a bit muted. But it has flatwounds, for that double bass feel. So, here we come to the second purchase that i ever made. It started in july, i saw this bass on eBay, and fell in love. I asked the guy to relist it in september as i was finally being awarded �1750 for a phonebooth breaking my tooth. So i bought it, and in september 2007, it arrived. I was so happy with it, i was extatic. But love fades, and as the realities set in of owning a heavy, twin neck mazeti, then i didnt want it anymore. So i replaced the 2 way switch for a 3 way, so both could be on at the same time, and then polished it, and sent it off to a guitar shop to be sold. Awaiting the sale. Well well well. Here is the love of my life. This awesome mother-fcuker cost me �1000. I also got it with my claim money, it took the last of it, and i don't regret it at all. To start off, it has the most amazing feel ever. The neck is super mega fast finger action. it allows me to play anything in my mind. Secondly, the finish on the body is fantastic. And no chips because it stays in its case when i dont play it. The sound!!!!!!! Like nothing i have ever heard before in my life. It is so powerful that it blows you away. The range is superb as it has a 3-band active equalizer. I have also fitted some strap locks that cost �15 so it will never fall. These were attached to a really long strap that is perfect for it. To be honest, i never want to let it go... EVER. WWell, when we say never, it doesnt mean what it means. I ended up finding a guy who was selling a modulus FB4, and i really wanted it. SO i put this one up for �850, and it got sold for �800. Which i was going to use with the �330 to get the new one. 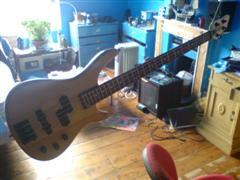 Unfortunately, it had been sold, so then i started squandering the money away, and now im left with �200 in the bank, after getting new everything, but mostly stuff to improve the current basses i now own. Que sera, sera.